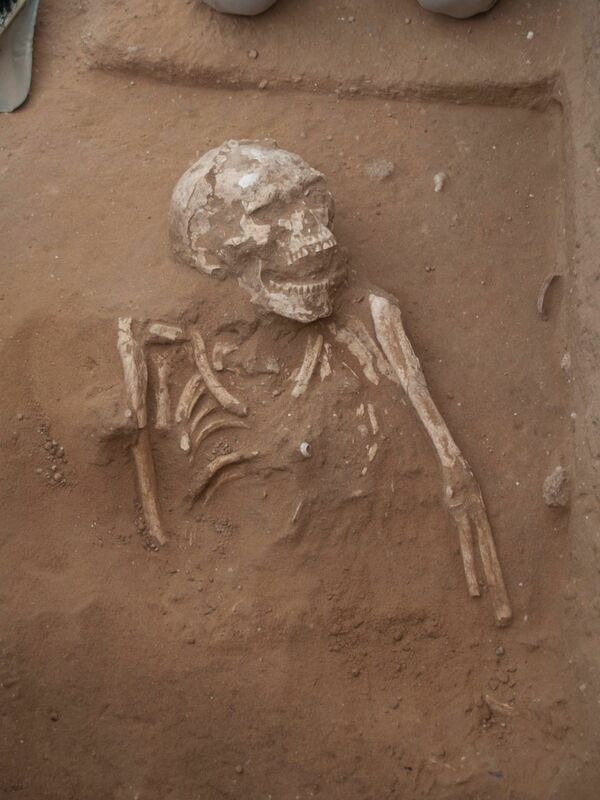 A huge Philistine cemetery some 3000-years-old has been found in the Mediterranean seaport of Ashkelon. The manner of the burials proves, for the first time, that the Philistines had to have come from the Aegean Sea region, and that they had very close ties with the Phoenician world. “Ninety-nine percent of the chapters and articles written about Philistine burial customs should be revised or ignored now that we have the first and only Philistine cemetery,” says Lawrence E. Stager, Dorot Professor of the Archaeology of Israel, Emeritus, at Harvard University. The cemetery was found just outside the city walls of Tel Ashkelon, one of the Philistines' five primary cities in ancient Israel. The cemetery was found to have more then 150 individual burials dating from the 11th to 8th century BCE. The undisturbed graves have shed fresh light on a mystery bedeviling archaeologists for decades: the Philistines' real origins. 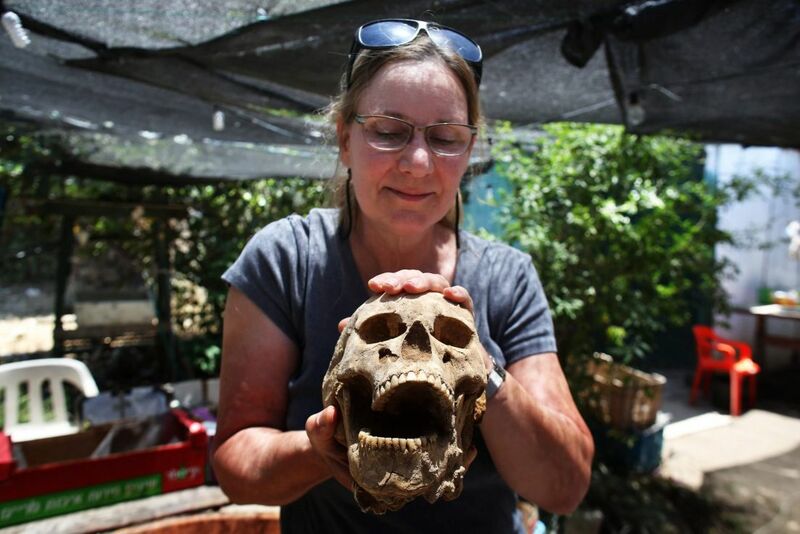 “The basic question we want to know is where this people are from," said Dr. Sherry Fox, a physical anthropologist who is sampling the bones for analysis, including for DNA studies, and radiocarbon and biological distance studies. 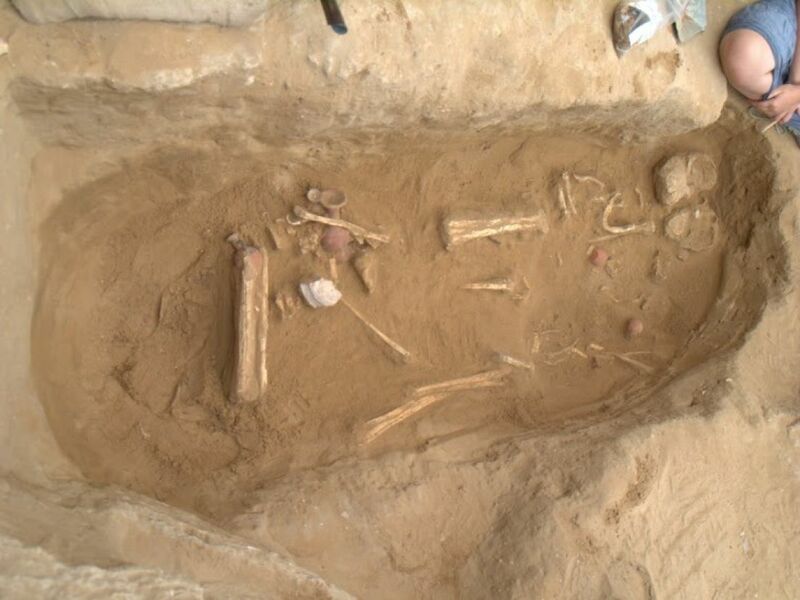 The unprecedented discovery of the Philistine cemetery allows the archaeologists not only to study Philistine burial practices for the first time, but also to gain insights on Philistine characteristics and lifestyle. With this discovery, the archaeologists finally have a data set not on one or two individuals but a whole population, explains Daniel M. Master, professor of Wheaton College and co-director of the Leon Levy Expedition. That in turn will enable them to talk about what’s typical and what’s not typical, he explains. “This forms a baseline for what 'Philistine' is. We can already say that the cultural practices we see here are substantially different from the Canaanites and the highlanders in the east," Master says. The bodies can also provide information about Philistine dietary habits, lifestyle and morbidity. One conclusion the archaeologists have already reached is that these particular individuals seemed to have been spared from strife. “There is no evidence of any kind of trauma on the bones, from war on inter-personal violence,” Fox told Haaretz. Unlike the typical burial practice in the region - family burials or multiple burials, where the deceased were laid on raised platforms or benches - the practice in Ashkelon was markedly different. The deceased were, for the most part, buried in oval pits. Four out of the 150 were cremated and some other bodies were deposited in ashlar burial chamber tombs. These are burial practices well known from the Aegean cultural sphere - but certainly not from the Canaanite one. Other finds that accompanied the deceased typically included storage jars, bowls and juglets, and in some rare cases fine jewelry - as well as arrowheads and spear points. A hoard of iron arrowheads was discovered by the pelvis of one man, the amount one would expect to find in a quiver. Spear-points and some jewelry were also found next to the Philistine bowman. In other instances, small vials that had contained perfume were found next to the deceased (probably an olive oil based with different fragrances) . In two cases the bottle was found at the nostril, pointing to the nose, presumably so that the deceased could smell perfume throughout eternity. In addition to the 150 individual pit graves found at the cemetery, six burial chambers with multiple bodies were found (when the bodies were found at all). A magnificent rectangular burial chamber was discovered inside the cemetery, built with perfectly hewn sandstones. But the large stone door that once stood at its entrance evidently could not hinder grave robbers from looting the tomb of its treasure and its occupants' skeletal remains. When the chamber was built and used is anybody’s guess. “The latest pottery is trash from the 7th century BCE, but the chamber might have been built and used somewhat earlier,” Master told Haaretz. Ashkelon became a flourishing trading hub during the Bronze Age because of its location on the Mediterranean Sea and its proximity to Egypt. It was through Ashkelon, which was situated just north of Gaza, that Egypt sold linen and papyrus – and also slaves – to the rest of the ancient world. 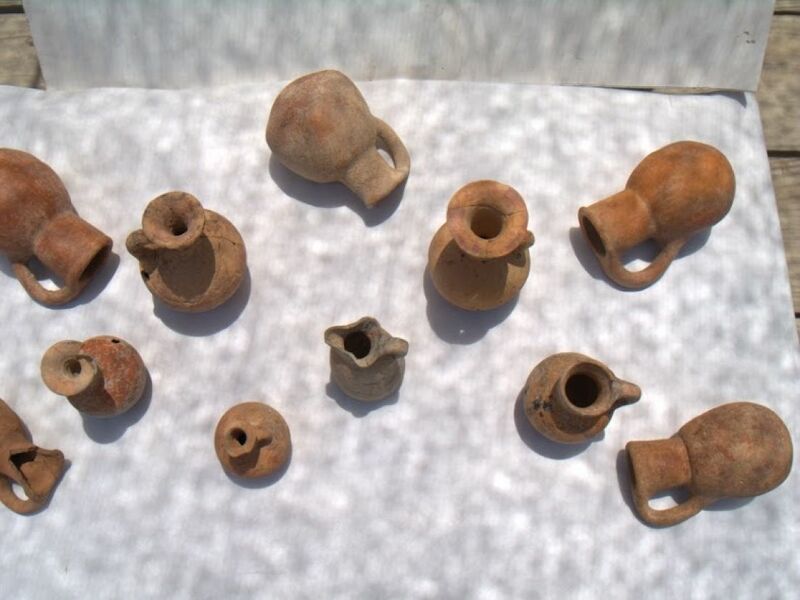 Other goods distributed through Ashkelon during the Iron Age (ca. 1185-604 BCE) included wine and textile. There is also evidence of grain imports from Judah, again attesting to the Philistine city as an important gateway between the East and the West. Ashkelon would remain a key trading center up to Crusader times. But it was destroyed by the Mamluk sultan Baibars in 1270 CE, a blow from which it never recovered. According to the Bible, the island of Crete (usually held to be identical with Caphtor Jeremiah 47:4; Amos 9:7), though not necessarily the original home of the Philistines, was the place from which they migrated to the Canaan coast. 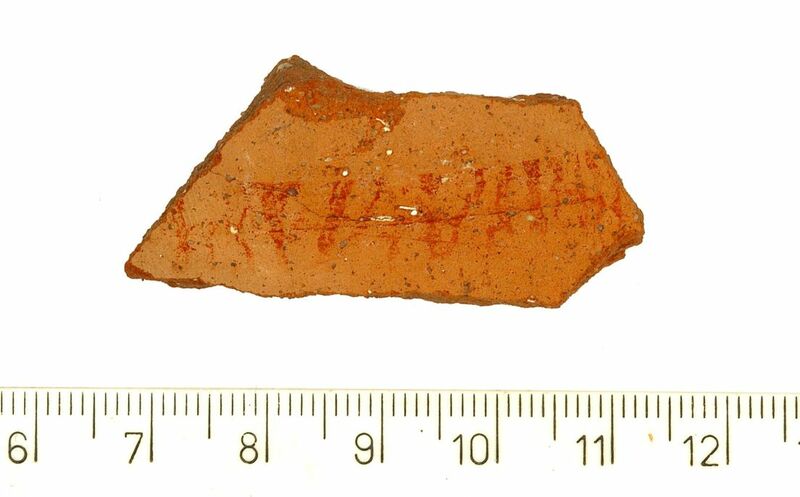 That the Philistines were not indigenous to Canaan is indicated by ceramics, architecture, burial customs, and pottery remains with writing – in non-Semitic languages (several inscribed stamp handles, as well as a pottery sherd with a Cypro-Minoan script, all dating to around 1150-1000 BCE). The ancient DNA-analysis may be the final nail in the coffin that settles the debate of the Philistines origins. Meanwhile, Lawrence E. Stager of Harvard has long been convinced that the Philistines came by ship, sailing from the Aegean area, perhaps Cyprus, to the South Canaan coast, and established themselves there before their great assault on Egypt. One of the earliest references to the Philistines is Ramesses IIIs mortuary relief at Medinet Habu. The relief portrays the Battle of the Delta, the grand struggle between the Egyptians and the Sea Peoples that took place at the mouth of the Nile during the early 12th century BCE (1176-75 BCE). Since the relief depicts oxcarts, chariots and ships, some scholars assume the Philistines came overland from Anatolia to Egypt. Stager is skeptical. “There is no way you can come with oxcarts from Anatolia, down through all the hills," he explains. "It makes much more sense if they came with ships, loading and offloading these vehicles." He also points out that the Battle of the Delta was the one known epic battle between the Egyptians and Philistines or Sea Peoples. There weren't two. 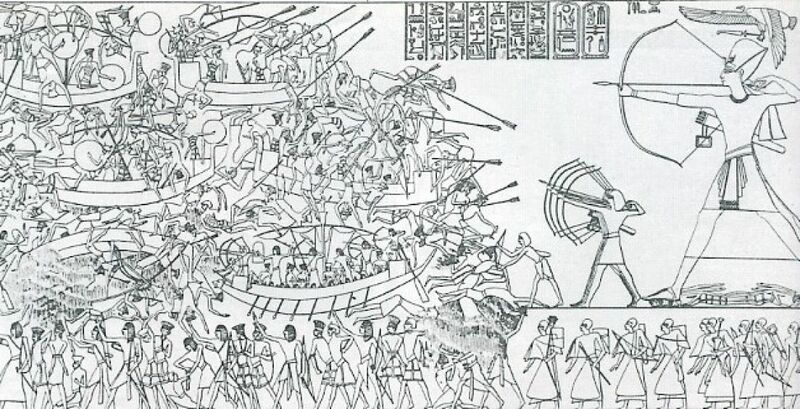 If the Philistines attacked the Egyptians, they would likely have sent a navy down the Mediterranean - and an army of land troops, effectively creating a pincer maneuver against Ramesses III, Stager speculates. Stager suspects the Philistines had to have been well entrenched in south Canaan before the Battle of the Delta. Ashkelon would have been one of the first strategic points the Philistines would have settled, securing as sort of “bridgehead”, before they launched their armada and infantry against the Egyptians in the Nile Delta. “Ramesses III tried to contain them in their five Philistine cities, but obviously he could not control them or drive them out," says Stager. Daniel Master differs: “I think Egypt was still in control of the region, even Philistia, and that the Philistines settled with Egyptian acquiescence. This is become a broader consensus over the last few years due to work at Megiddo, Jaffa, and Ashkelon itself, where we find many Egyptian objects from this period,” he told Haaretz. At this point, we do not know if the Egyptians managed to subdue the Philistines. But we do know that the Philistines did eventually have their comeuppance. In early December 604 BCE, the Babylonians swept through Philistia, destroying the cities and exiling its inhabitants. The Babylonian ruler Nebuchadnezzar torched Philistia in early December 604 BCE, yet within the massive destruction, architecture, ceramics and even foods remained, providing the archaeologists with a snapshot of life in a Philistine city during the 7th century BCE. 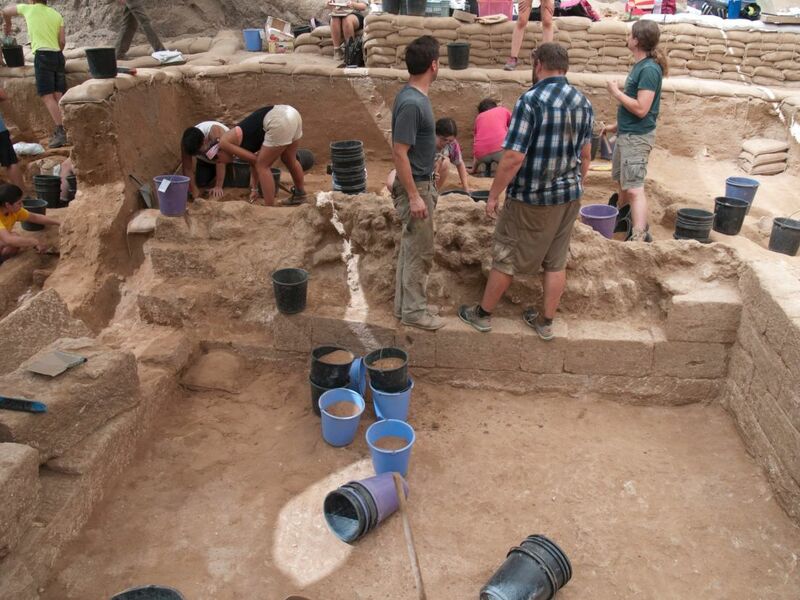 2016 marks the final season of the Leon Levy Expedition to Ashkelon, where they have been excavating since 1985.